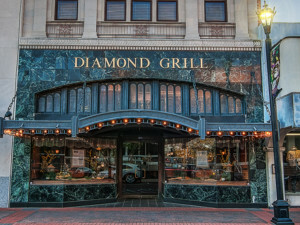 In 1931 it was a downtown jewelry store… now Diamond Grill, recipient of the 2006 Louisiana Preservation Honor Award, offers a wide range of superb menu items to suit every taste and budget. Try one of the nightly featured specials for a true delight. We pride ourselves on combining all the elements of a memorable dining experience! Visit us for Prime Steaks, Fresh Seafood and Unique Chef Inspired Creations combined with amazing service in an atmosphere like no other. Executive Chef, William Leroux characterizes his food as Creole cooking implementing French techniques. Growing up in New Orleans, William Leroux, our executive chef at the Diamond Grill, says he seemed to soak up the distinctive flavors of the Creole and Cajun cultures from the time he was a boy. “Cooking came natural to me and I really loved it,” Leroux says. “It takes a special kind of person to be in this field because it is a challenging profession. It’s rewarding but it is a lot of hard work, and making people happy through my food brings me a lot of joy,” Leroux notes. One of his signature dishes is Pan Sautéed Drum Fish With Lemon Caper Buerre Blanc. Please join us for a delightful candlelight dinner as you enjoy superb Cuisine and exceptional service in a visually rich historical setting. The building features twenty-two foot ceilings, original chandeliers, ornate plaster, dramatic staircase, true wine vault and an elegant Mezzanine bar. Also included is ample banquet and meeting space that will accommodate up to 120 guests . Our commitment is to deliver a dining experience, which you will want to share with others and repeat often.